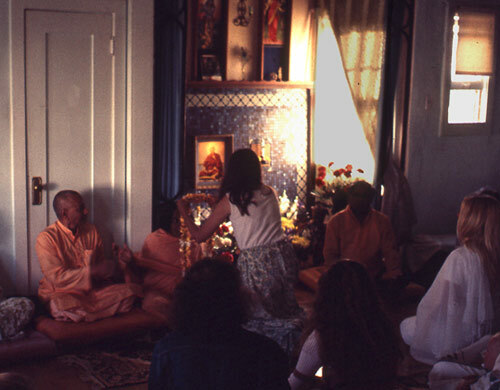 Here at the Sivananda Yoga Centre in Los Angeles with Swami Vishnu (right ..in shadow) and Swami Hrdayananda (centre being garlanded by then co-director, Radha Speer), Venkatesananda (far left), in his usual spot (not attracting attention or blocking the view of photo of Master Sivananda in the altar), sitting with his back up against the closer door. 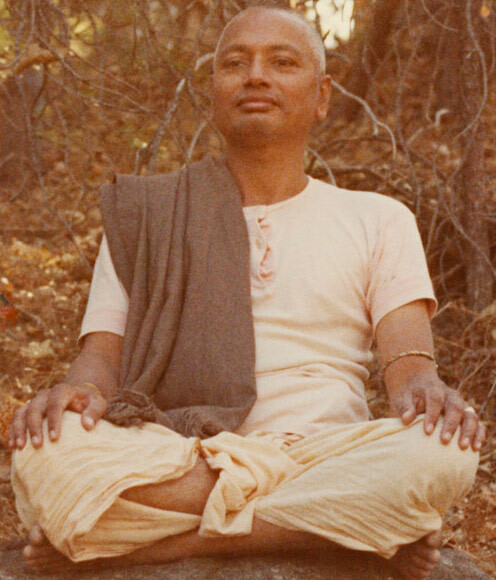 He often sat in that spot, even when he was the only Swami present, giving many inspiring talks and making us laugh continuously so that we could learn not to take ourselves too seriously. 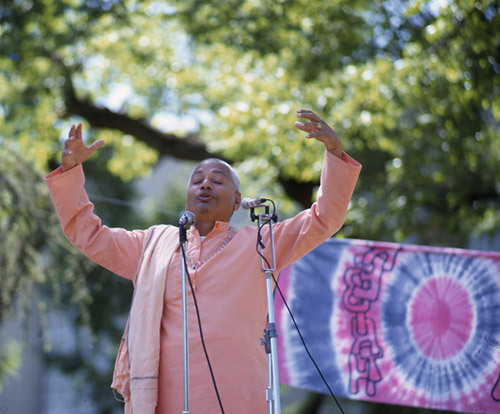 Soon after his arrival at the Sivananda Yoga Centre, some special guests arrived to join Swami Venkatesananda for his annual Durga Puja, the worship of The Divine Mother. 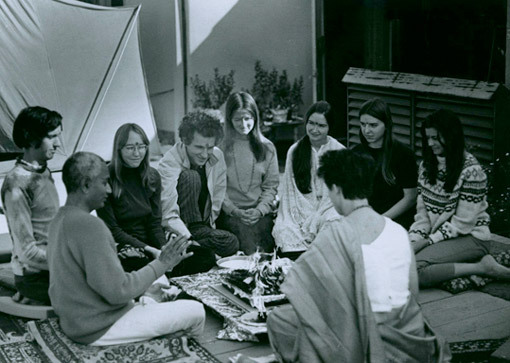 Seated from the far left is Bill Thomas, Susan Thomas (Swami Sushilananda), Shankara, Judy Tobler, Radha Speer, Joan Hyman,, Yvonne Jaya Dardenne and Mrs Paulene Mudge of South Africa. Here they are as they would be all week long, fasting, chanting the powerful bjia mantra "Om Aim Hreem Kleem Chamundaye Vichche" and giving homage to the power of Durga. 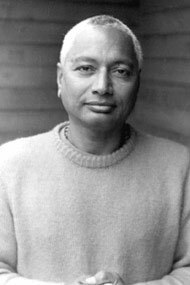 Giving a talk on yoga to students (and making them smile) on the back deck of the Sivananda Yoga & Vedanta Centre on Larchmont Blvd. in Hollwood, California in the early 1970s. 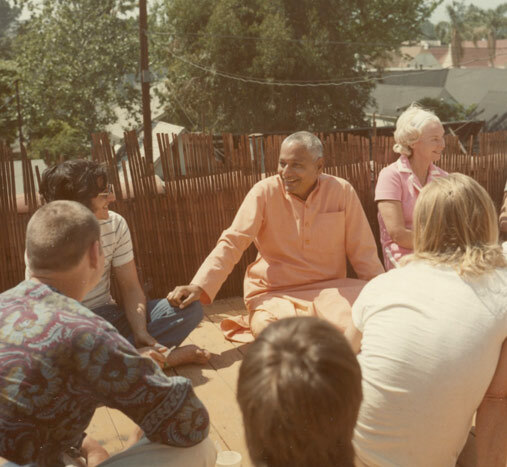 At a weekend yoga retreat in October of 1970 in the San Bernadino mountains. 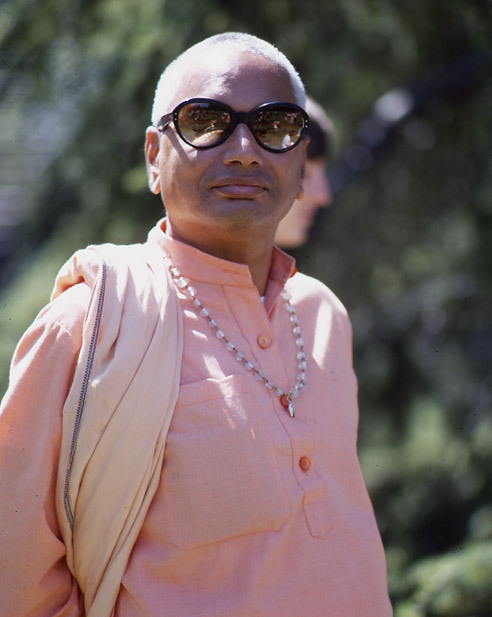 Swami Venkatesananda was fond of pointing out that if you wanted to come to the yoga retreat, you would have to stop referring to it as a "yoga retreat," and start calling it "a yoga advance!" 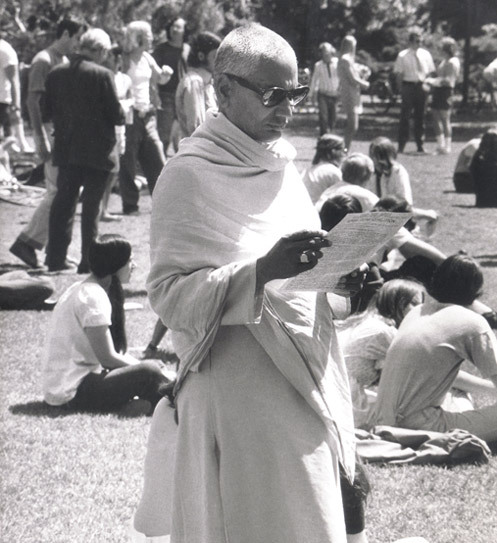 If there was a drought in California in those days, it certainly wasn't a yoga drought. 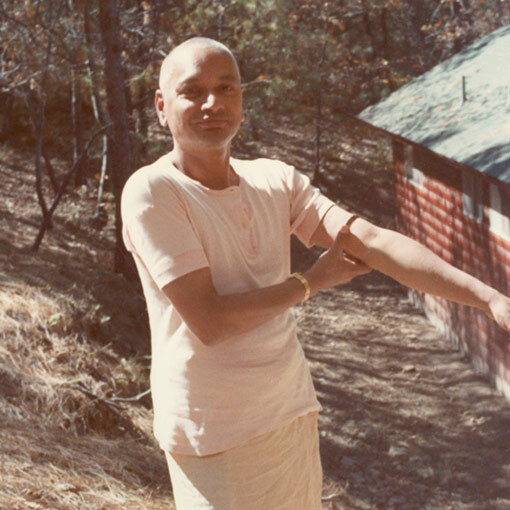 Off in the woods to lead a discussion on yoga and also introduce meditation to students attending the yoga "advance," as he called it (Swami Venkatesananda felt the term "Yoga Retreat" set the wrong tone: "Call it a Yoga Avance! That's a better name for it!" 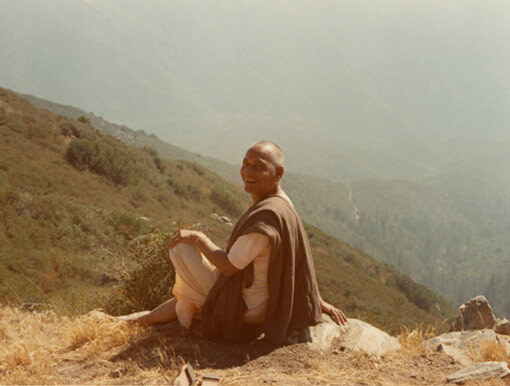 Taking a short break from his "yoga advance" in the San Berndadino Mountains outside L.A. to enjoy being above all the California smog, which in those days, before automobile pollution devices, was so much worse than it is today. Sitting and talking during Earth Day events. 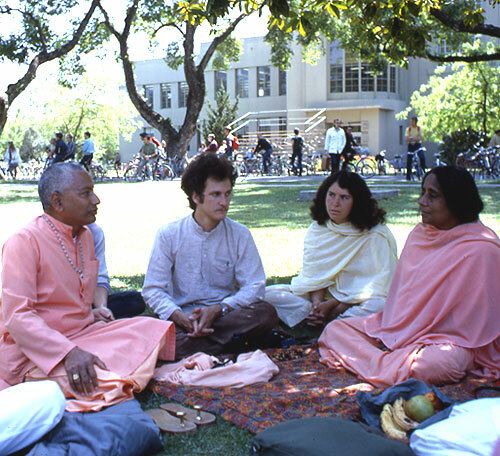 From left to right, Swami Venkatesnanda, Ganga White(of White Lotus Foundation) seated to the right of Swami Venkatesananda, unidentified student (white shawl), and Swami Hrdayananda on the far right.